Somebody already wants to sell the TVS Apache 310 sportsbike. And the reason for the sale is ‘relocation abroad’. Not surprisingly, this listing is from Bangalore, a city that hosts lakhs of IT professionals, who often relocate abroad for work. Meanwhile, the owner of this particular Apache 310 is asking Rs. 2.5 lakhs for the motorcycle, which has covered 3,100 kilometers and is 3 months old. A brand new TVS Apache 310 costs Rs. 2.76 lakhs, on-road Bangalore. Generally, motorcycles lose about 10 % of their on-road price as soon as they’re ridden out of the showroom. This particular listing’s price seems par for the course, although buyers will want an additional 10,000-20,000 rupees off. 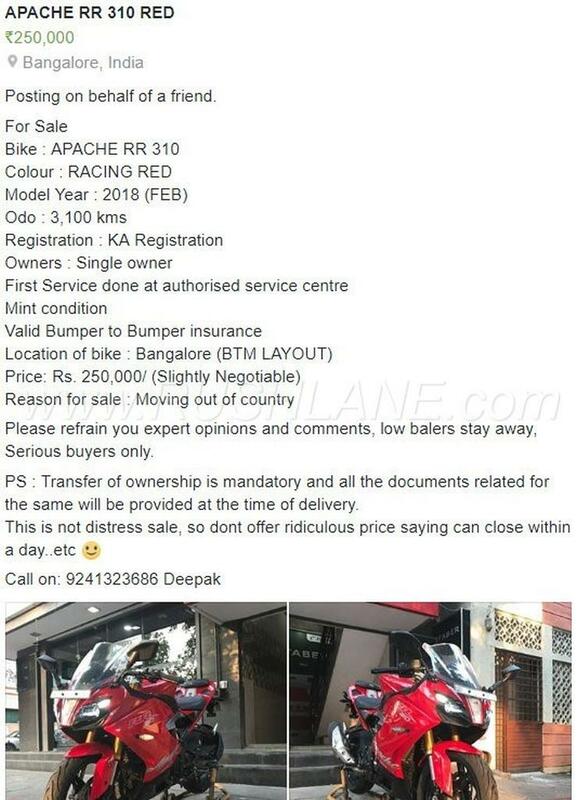 In this case, the owner says that it’s not a distress sale, which means that he’s willing to wait for the right price rather than selling the motorcycle in a hurry. The Apache 310 is TVS Motors’ flagship motorcycle and features and shares parts with small capacity motorcycles such as the BMW G 310R and GS 310R. The motorcycle is powered by a unique, reverse inclined engine that displaces 311cc. The engine’s unique layout allows mass to be centralized, making the motorcycle’s design more compact. This engine makes 34 Bhp and 28 Nm, and is liquid cooled and fuel injected. A 6 speed manual gearbox is standard with this single cylinder engine. Suspension on the TVS Apache 310 consists of upside down front forks and a monoshock rear. Alloy wheels are standard with tubeless rubber. Disc brakes on both wheels get dual channel ABS as standard. The TVS Apache 310 is styled aggressively, and its design makes it one of the best looking small capacity fully faired motorcycles on sale in India. In fact, the design is a major selling point of this motorcycle, which does look like a high-end Ducati superbike from certain angles. Currently, the motorcycle commands at least a 2 month waiting period in most bigger cities of the country.